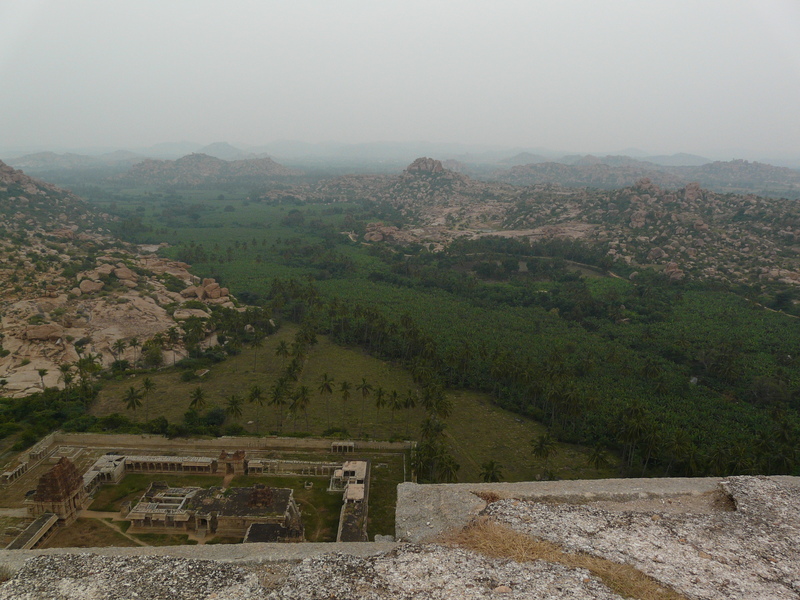 This series of posts should more rightly have been titled something like “Vijaynagar Vagabonding”, but “Hampi Hopping” has a certain ring to it, so I’m sticking with it! 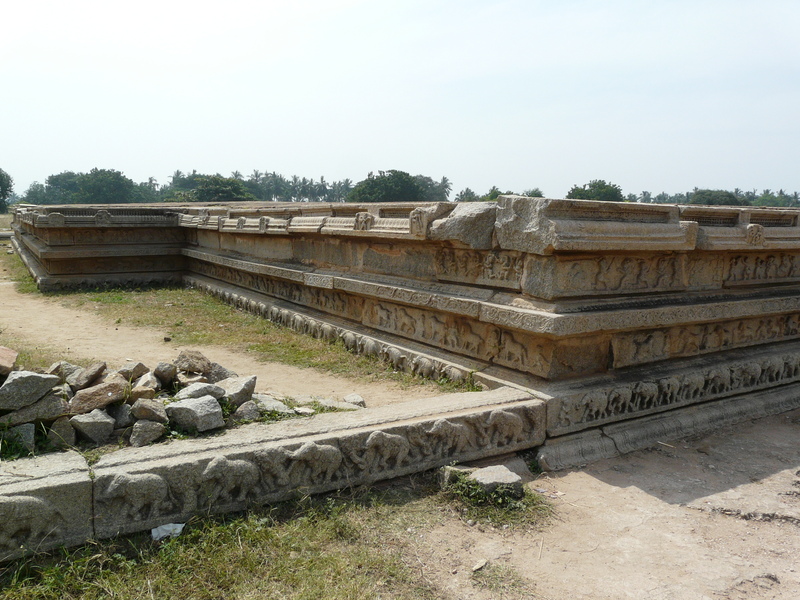 In any case, I had visited the much-celebrated ruins of Vijaynagar in November 2017, and spent about 8 days exploring the vast site (or sites) of the former capital city of the Vijaynagar Empire. I could have spent many more. The city and empire were founded in the first half of the 14th c AD, and construction activity continued till the city was abandoned and sacked in the mid-16th c AD, after the Vijaynagar army was defeated by those of the Deccan Sultanates. What remains is a sprawling collection of ruined temples, palaces and fortifications. 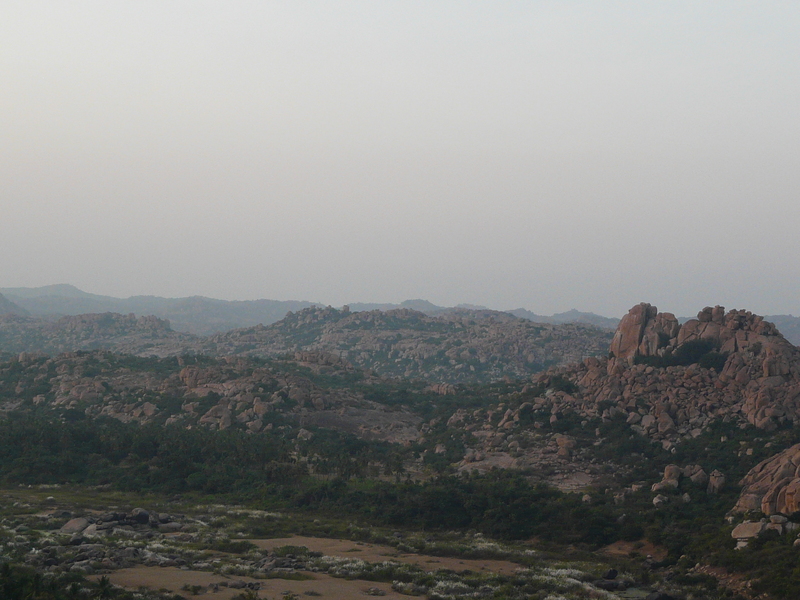 These are set amidst a surreal landscape of entire hill ranges of huge granite boulders and exposed granite bedrock. Through this landscape flows the Tungabhadra River, now thoroughly checked by a large dam at the nearby town of Hospet. Part of the experience of hopping around Hampi is walking on this bedrock and around these boulders to explore temple after temple, palace after palace. 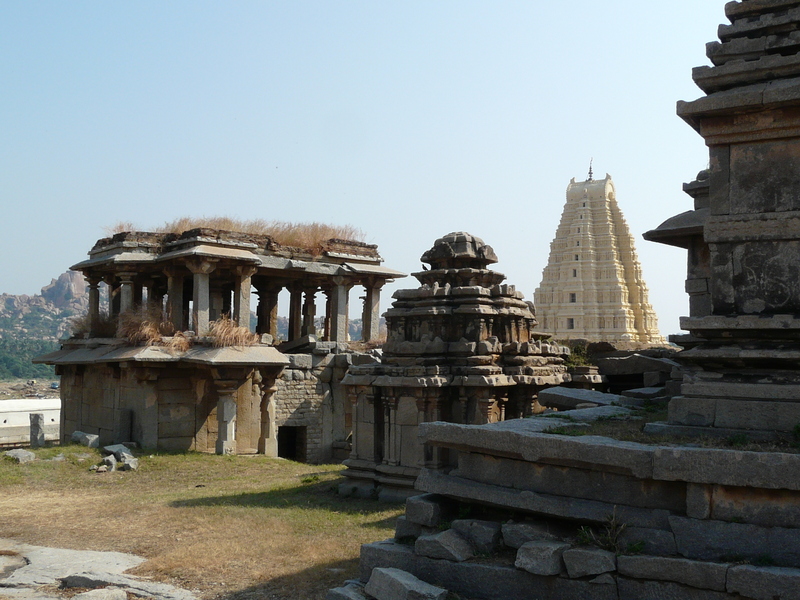 And just to clarify, Hampi or Hampi Bazaar is the village where the active Virupaksha Temple is located, and Vijaynagar is/was the name of the large capital city which encompassed all the ruins we see today. 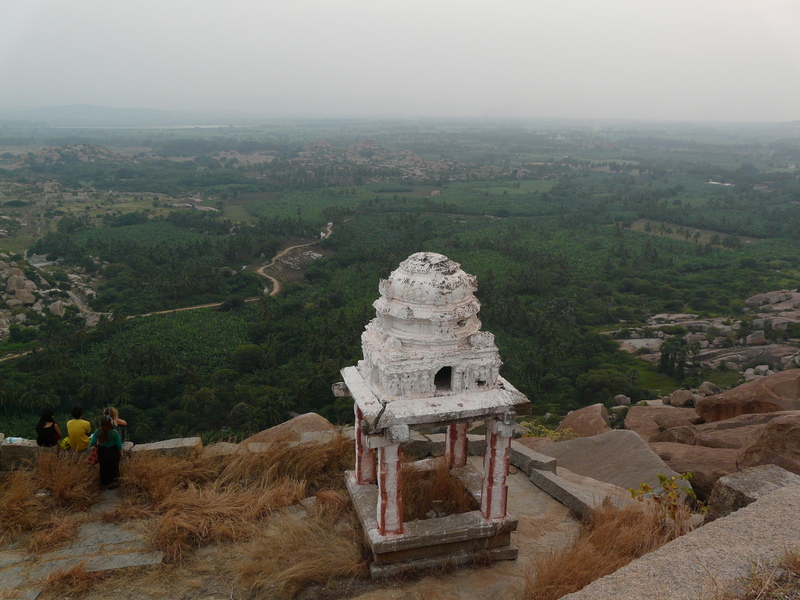 Guidebooks to Vijaynagar divide it into the Sacred Center and Royal Center. 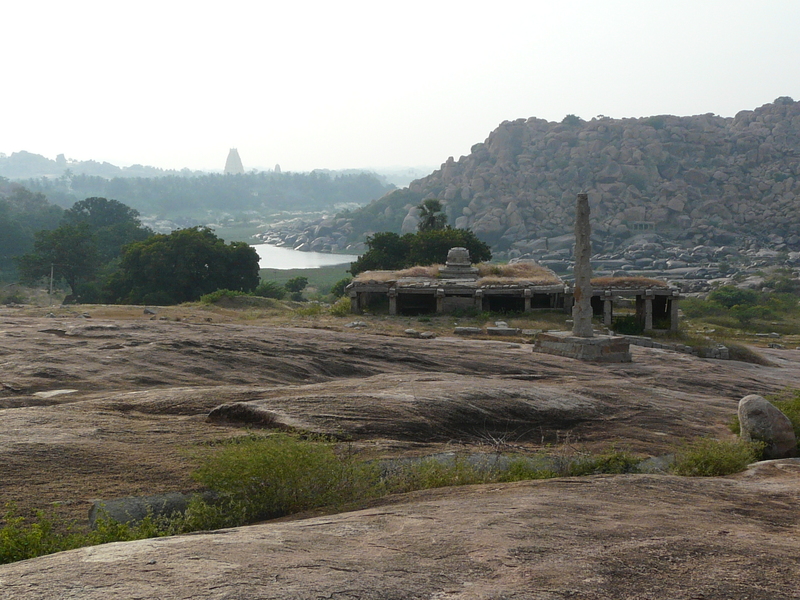 The Sacred Center stretches along the Tungabhadra River, from Hampi Bazaar and the Virupaksha Temple on its western edge to the Vitthala Temple and its long colonnaded street on the eastern edge. This is the zone where many of Vijaynagar’s temples are located. 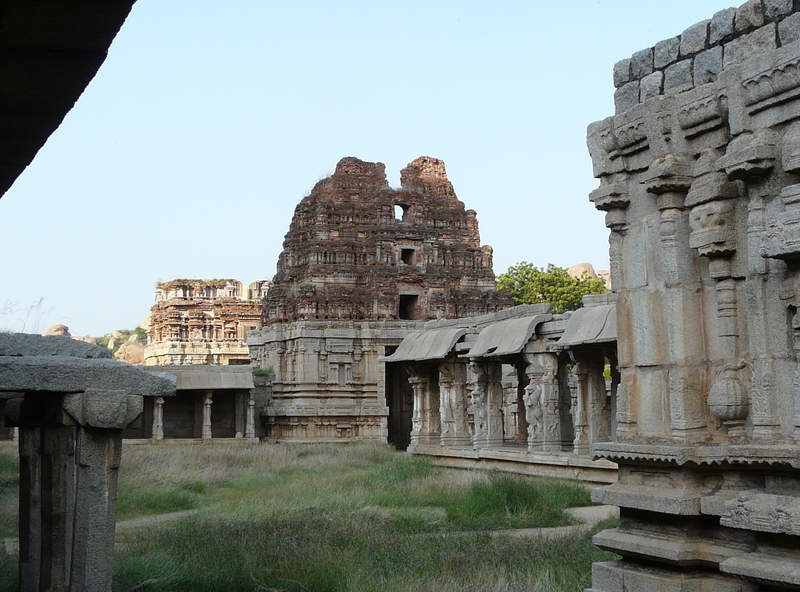 South of the Sacred Center is the Royal Center, which houses the palace complexes of Vijaynagar. 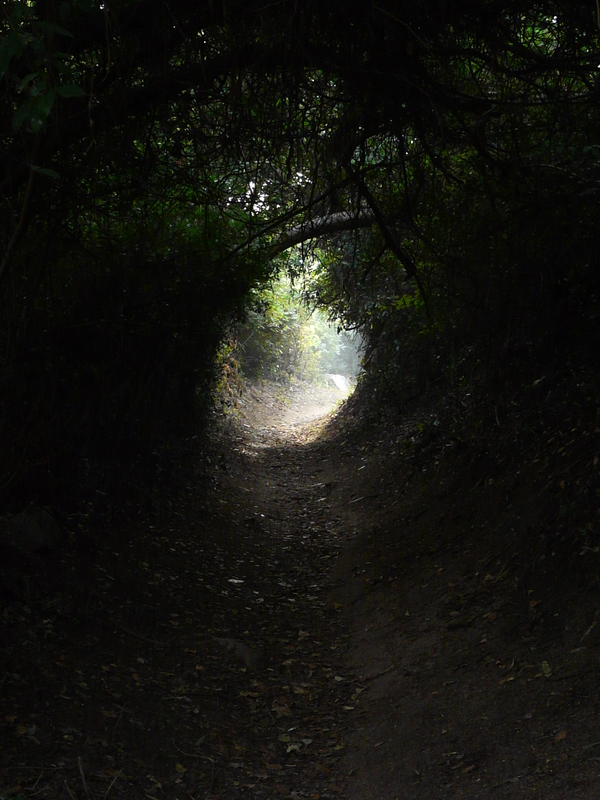 Apart from these I have used a third category to sort my upcoming posts, an Outer Circuit that explores the more outlying architecture of Vijaynagar. The two images below look southwards from Matanga Hill in the Sacred Center towards the irrigated and cultivated valley that lies between the hills of the Sacred Center and Royal Center. 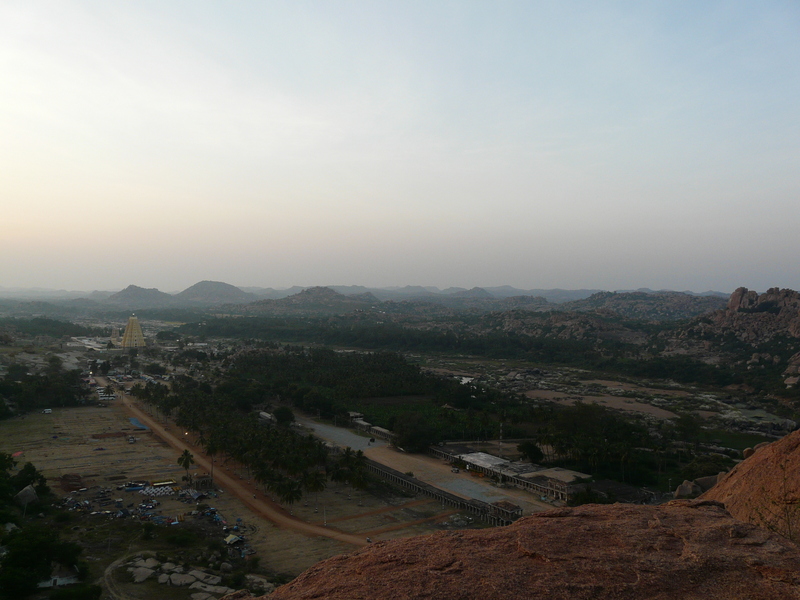 In the first photo the Achyutaraya Temple can be seen at the bottom left. 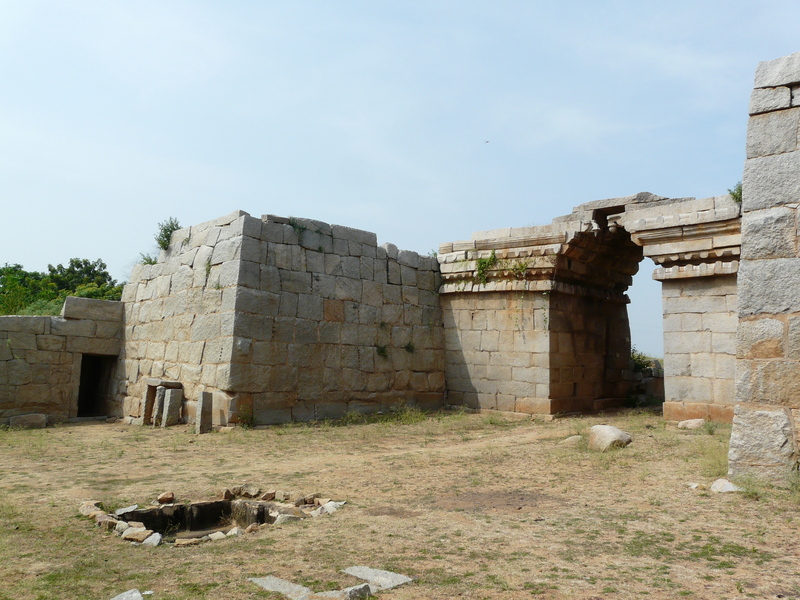 One of the interesting aspects of Vijaynagar architecture can be seen in the images immediately above. “Sacred” temple architecture at Vijaynagar follows very traditional Hindu temple vocabulary (and in fact was part of the stylistic development of that vocabulary in southern India), while the “secular” palace structure of Lotus Mahal borrows freely from contemporary Islamic architecture, especially that of the Deccan Sultanates. 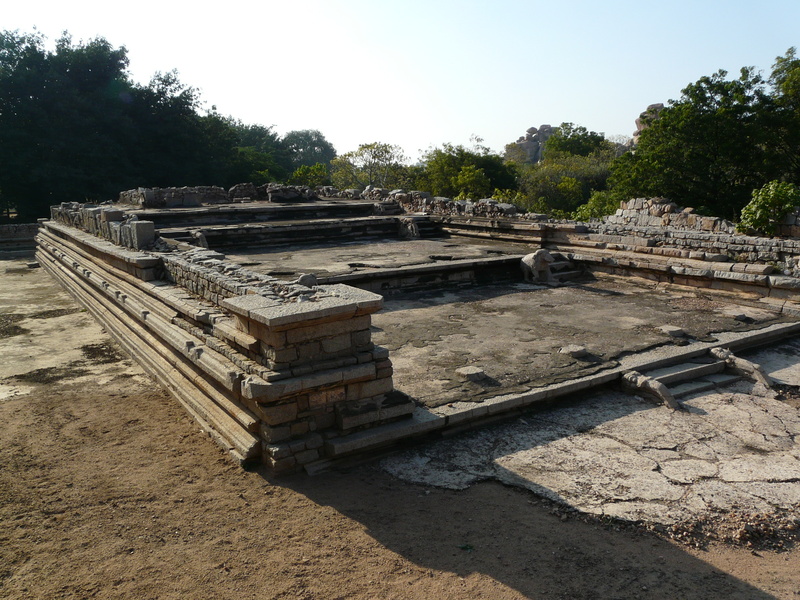 This is a common contrast in Vijaynagar, and can continue to be seen in the subsequent Nayakar period, for example in Madurai with the Minakshi Temple and Tirumalai Nayakar Palace. Now on to subsequent posts that will cover individual structures or groups of structures in more detail! 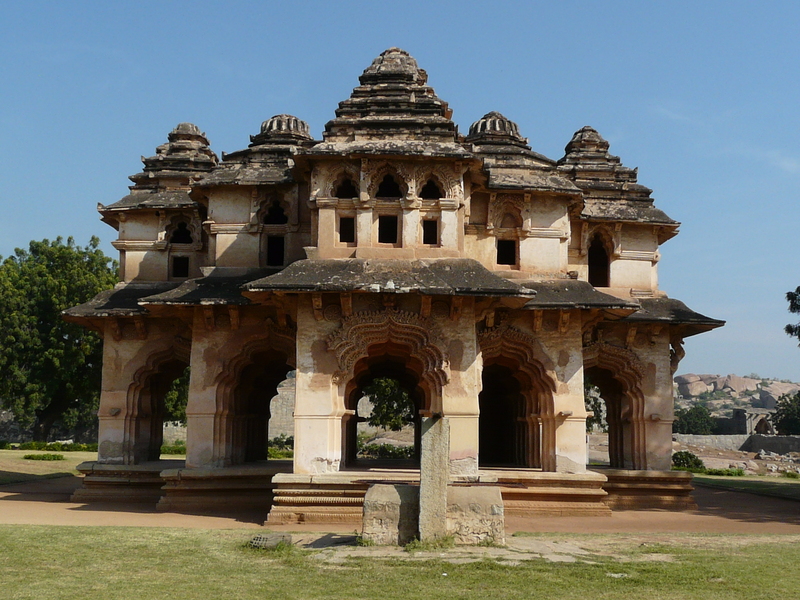 This entry was posted in Karnataka and tagged hampi, Karnataka, palaces, sacred center, temple, vijaynagar. Bookmark the permalink. So nice to have you back “online,” keep the posts coming!